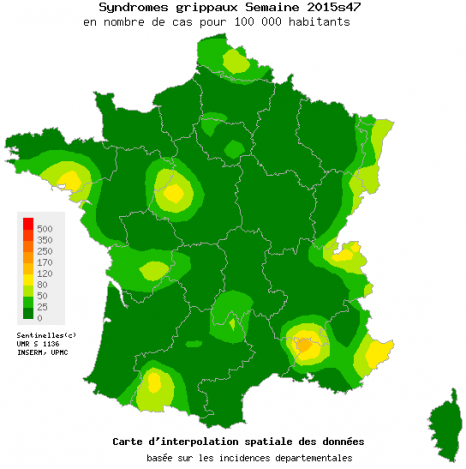 Spread of influenza remains low in metropolitan France according to the weekly bulletin of 25/11/15 from the Sentinelles network, an information system based on a network of 1,300 general practitioners, with the incidence of influenza-illness estimated at 24 cases per 100,000 inhabitants, i.e. below the epidemic threshold (149 cases per 100,000 inhabitants). Surveillance of the virus in metropolitan France continues nonetheless, with the launch of the fifth season of GrippeNet.fr this Wednesday, 25 November. Originally launched in January 2012 by the Sentinelles network team (Inserm – UPMC) and the French Institute for Public Health Surveillance (InVS), GrippeNet.fr offers everyone living in metropolitan France, whatever his/her health status, a chance to participate in influenza surveillance anonymously and voluntarily via its website. The data thus collected help to complement traditional surveillance systems, provide real-time information on the spread of influenza among the metropolitan population, and contribute to research aimed at achieving a better understanding of the epidemic. Over 6,000 citizens have become involved in GrippeNet.fr since the project was launched, thus becoming actively involved in influenza research and surveillance in France and Europe.